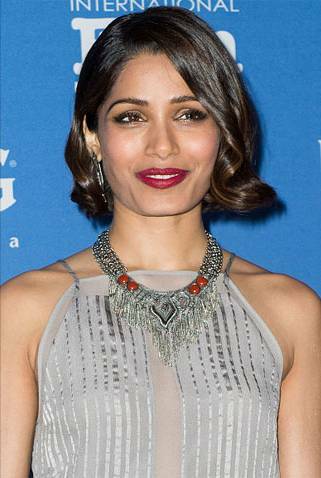 I love this modern take on a classic Grace Kelly ‘do on the radiant Frieda Pinto. L’Oreal Paris Celebrity Hair Stylist Mara Roszak created the look for Frieda’s appearance at last night’s 30th Santa Barbara International Film Festival. Here’s how to recreate it yourself, in Mara’s words. Step 1: I started by applying L’Oreal Paris Advanced Hairstyle Blow Dry It Blow Out Thermal Smoother Cream ($4.99) to towel-dried hair. Step 2: Then, I below out hair with a small round brush, and after each section, pin curled the hair. Because Freida has a new bob, some of the shorter pieces were curled under and not pinned up. Step 3: While hair was cooling in the curls, I sprayed L’Oreal Paris Elnett Satin Hairspray Extra Strong Hold Unscented ($14.99) all over lightly for hold. Step 4: I released the curls and gently brushed through the hair with a paddle brush. Step 5: With a 1” barrel curling iron, I wrapped section of the hair towards her face creating an old Hollywood wave. The front section of Frieda’s side part was curled away from the face, and pinned in place creating an “S” shape in the front. Step 7: To create extra shine, I finished by spraying L’Oreal Paris Advanced Hairstyle Sleek It Strand Smoother Serum Spray ($4.99) all over.